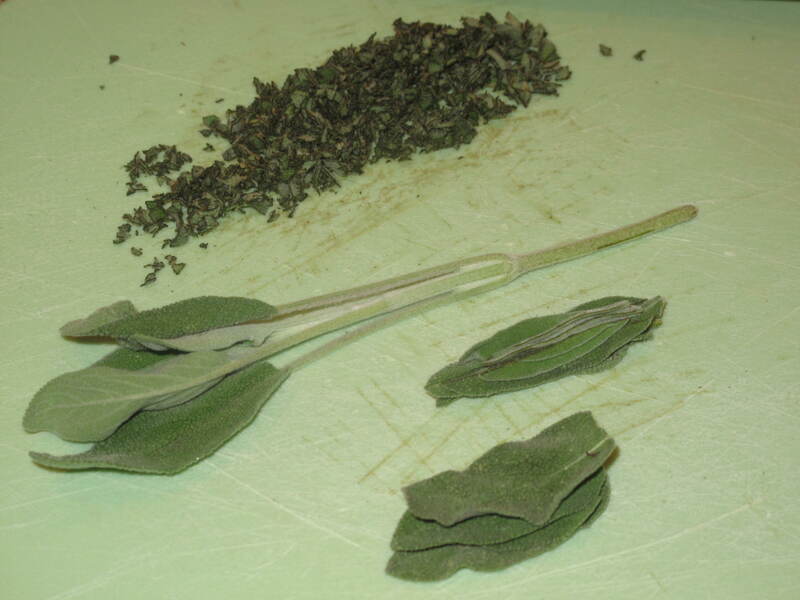 This is some finely chopped sage. 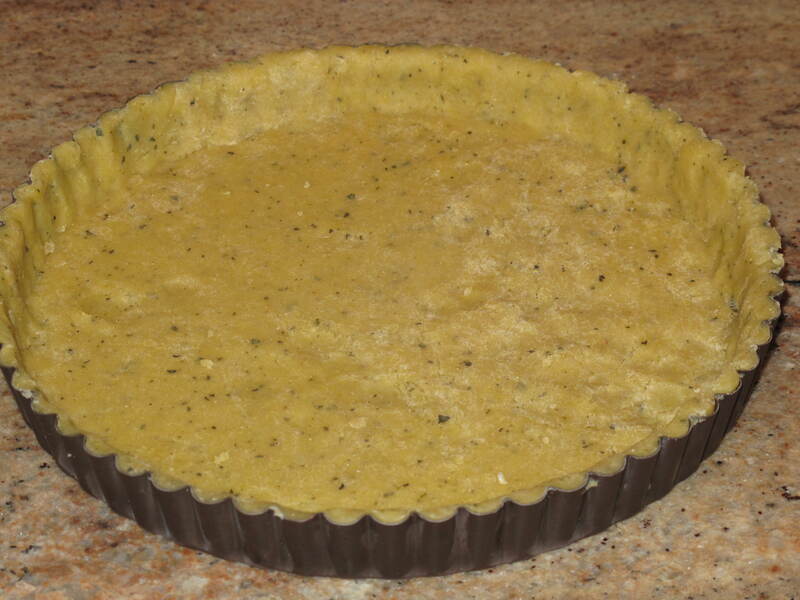 It is for the crust of a lemon tart that I made for dessert. It is no secret that I don’t really like citrus flavors in the food I cook. I’m not a big fan of zest in anything and I don’t like to punch up any flavor with citrus juice. When the troops were asking for something that had lemon in it, I had to think what recipes I had that at least had something in it that would interest me. 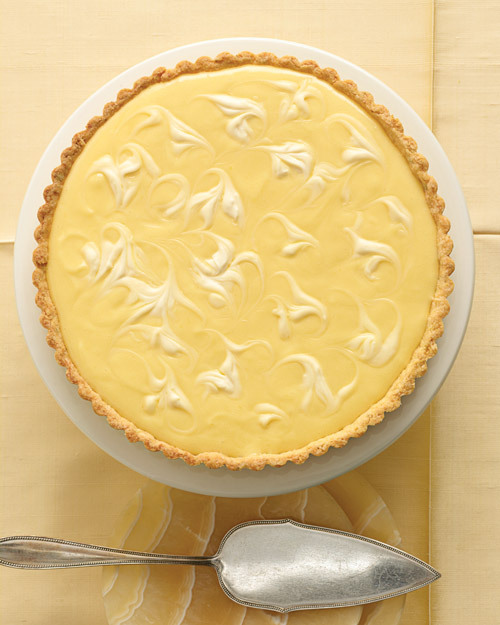 I have been reading Martha Stewart’s ‘Pies and Tarts’ and I saw this recipe for a Marbled Lemon Tart with a Sage and Cornmeal Crust. This sounded different enough. This was what I would make to get the lemon lovers their fix. I was actually surprised. A crisp crust that contained sage and cornmeal, along with lemon curd that had its bite taken down a few notches by the addition of creme fraiche. It was pretty good. So let’s make a lemon tart that even non-lemon heads can handle. Pulse flour, cornmeal, sugar, sage, salt and lemon zest in a food processor until combined. Add butter; pulse until mixture resembles coarse meal. Whisk egg yolks and ice water in a small bowl. With machine running, add to flour mixture through feed tube; process until dough just holds together. Turn out dough onto a work surface. Divide in half, and shape each portion into a disk. Wrap in plastic, and refrigerate 30 minutes (or up to 2 days). On a lightly floured work surface, roll out 1 disk to a 10-inch round. Fit into a 9-inch tart pan with a removable bottom; trim edges flush with rim. Refrigerate until firm, at least 1 hour (or up to 1 day). Reserve remaining dough for another use (it can be frozen up to 3 months). Preheat oven to 375 degrees. Dock the shell by pricking the bottom of tart shell with a fork. Bake until golden brown, about 25 minutes. Let cool. Sprinkle gelatin over cold water in a small bowl, and let stand until softened, about 5 minutes. 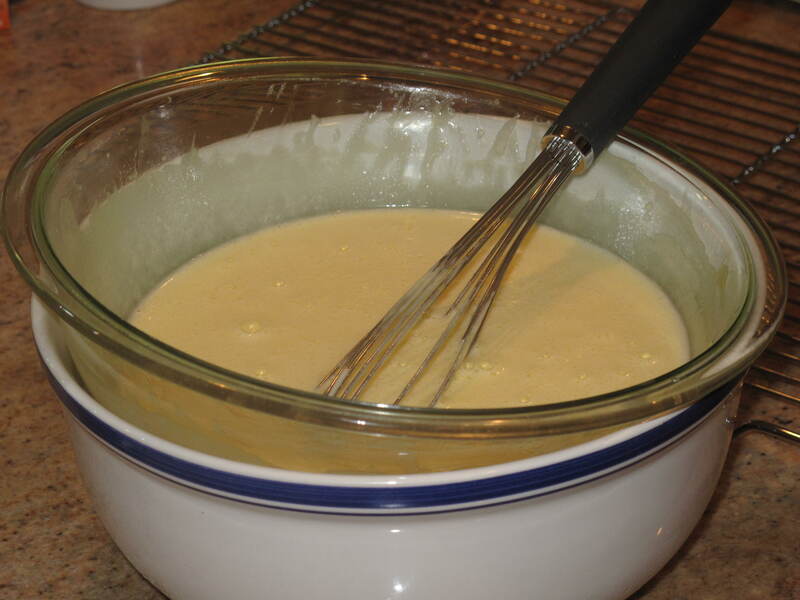 Whisk together egg yolks, sugar, and salt in a large heatproof bowl. Gradually whisk in lemon juice. Place bowl over a saucepan of simmering water, and whisk constantly until mixture has thickened and registers 160 degrees on an instant-read thermometer. Whisk in gelatin mixture. 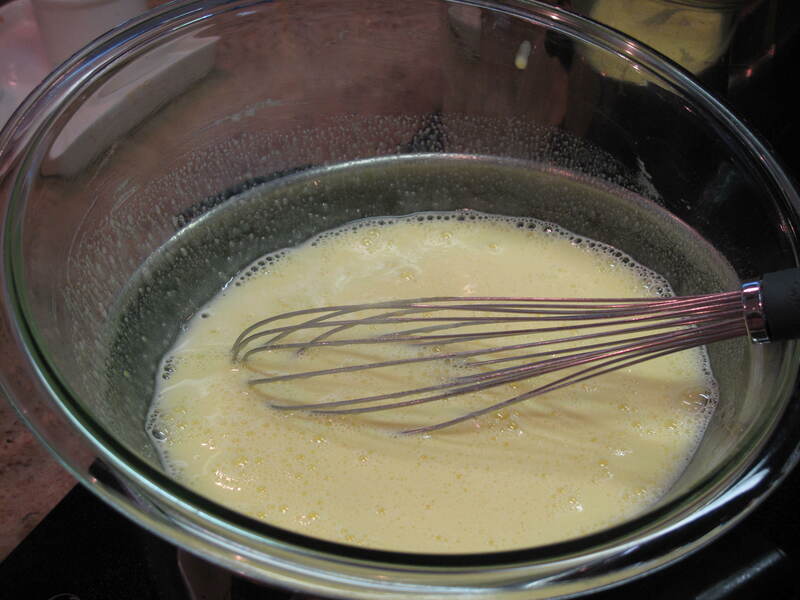 Remove from heat and whisk in butter, a few pieces at a time, until smooth. Let cool, stirring occasionally. Prepare an ice-water bath. Place bowl of yolk mixture over bath and stir until slightly thickened, about 2 minutes. Spread curd into crust; smooth top. Dollop creme fraiche on top. Using a wooden skewer or the tip of a knife, swirl creme fraiche into curd to create a marbleized effect. Refrigerate until firm, at least 2 hours (or up to overnight). In my rush to get the dessert out to the lemon lovers, I forgot to take a picture of the finished product so I included a copy of Martha’s so you get the feel. While no one’s dessert can look as good as one shot by a professional photographer, mine was pretty close….let’s just say in a more ‘rustic’ way. Given that I usually give citrus the cold shoulder, even I thought this dessert was pretty tasty and refreshing. So when lemon is the name of the game, give them something different with a lemon tart with a marble swirl in a sage-cornmeal crust. It’s the perfect summer treat. What desserts do you make that contain lemons? This entry was posted in Food and tagged Acorns, Baking, Blog, Cooking, Entertainment, Family, Food, Fun, Life, Lifestyle, Love, My Life, Photos, Recipes. Bookmark the permalink. Thanks Casey. Appreciate the comment! Hi Teresa. This is a good one. Thanks for the comment! Oh my this looks very complicated. I love lemon and I know it would be worth me trying to make it. Some people just don’t have the baking touch as others so right away I think “failure”. Yours turned out very nice. It was very tasty. Come back and visit soon, Carolkin. I’m planning on trying this recipe tomorrow. Generally, i’ve strained lemon curds. This recipe doesn’t call for it (I guess because double boiler method is used). Do you think straining is necessary for this recipe? Thanks! Hi Neera. Welcome to Acorns On Glen. No, straining is not necessary. Mine was very smooth and delicious. I hope you like the recipe. We loved it here at our place. It didn’t last very long. Come back and visit us soon. Please let us know what you think. I think you are going to like it.